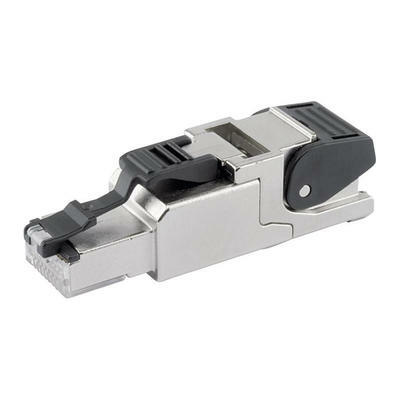 Telegärtner RJ45 connectors use a patented combination of geometry and circuitry to minimize the inevitable impedance mismatch that occurs as when a cable’s 4 twisted pairs are laid out in a straight row. The scale of this performance difference is slap-in-the-ears obvious and indicative of the difference all connectors make, and installers who compare these connectors will have the opportunity to hear for themselves just how big a deal a connector can be. The MFP8 Cat.6A is the RJ45 plug for time-saving and efficient on-site assembly for all networks, from Voice right through to 10 Gigabit Ethernet. It can be assembled on all standard types of cable in just 60 seconds – and no special tools are required. Whether in the office, data centers, in industry or in home networks – the MFP8 Cat.6A offers unprecedented flexibility and saves time and money on installation, repairs and maintenance. in the new MFP8 Cat.6A.